I've got a SQL Server (2012) and I need to create a read-only user. At first, I was just going to create a user, and then give them the db_datareader role. But while looking around, I saw the public role, and how it had Select, Update, Insert and Delete privileges on all the objects in the db. Is there a way for me to say "Yes, I know you are a member of the public role, but I'm revoking privileges X,Y,Z"? "Denies a permission to a principal. Prevents that principal from inheriting the permission through its group or role memberships. DENY takes precedence over all permissions, except that DENY does not apply to object owners or members of the sysadmin fixed server role. Security Note Members of the sysadmin fixed server role and object owners cannot be denied permissions." But I would advise you to investigate why Public has all those permissions. That's not a common or recommended security model. Not the answer you're looking for? Browse other questions tagged sql-server-2012 permissions role or ask your own question. What is the bare minimum access needed in the public role? 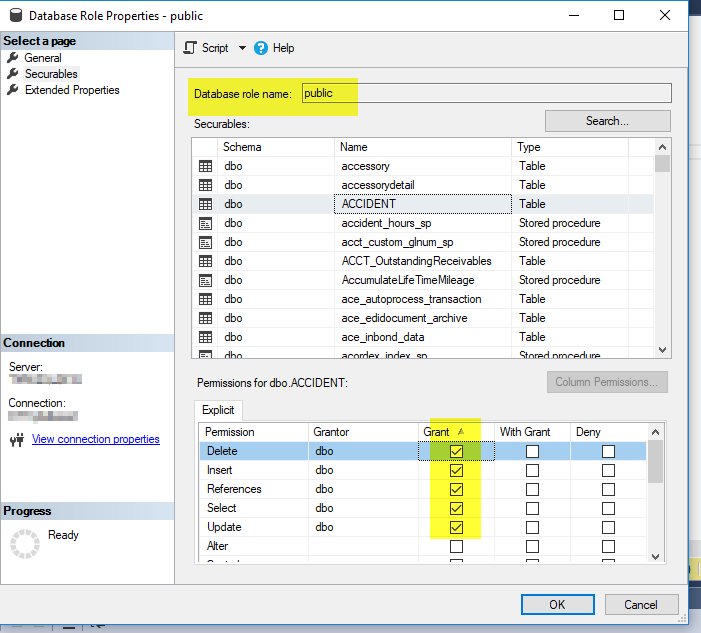 Is db_executor a standard role in SQL 2012 r2? Obvious reason Postgres Users can't read a table?